For #ThrowBackThursday we are sharing a post with you from 1995. Steve Reynolds, now World Vision’s Director of Advocacy Mobilization, brought to life Moe Moe’s struggle with polio in Myanmar. This was just three years after global leaders pledged to eradicate polio by 2000. Though this goal was not fully met, polio has been reduced by 99 percent and only survives in the most marginalized places. Immunization is one reason that this disease is nearly eradicated. 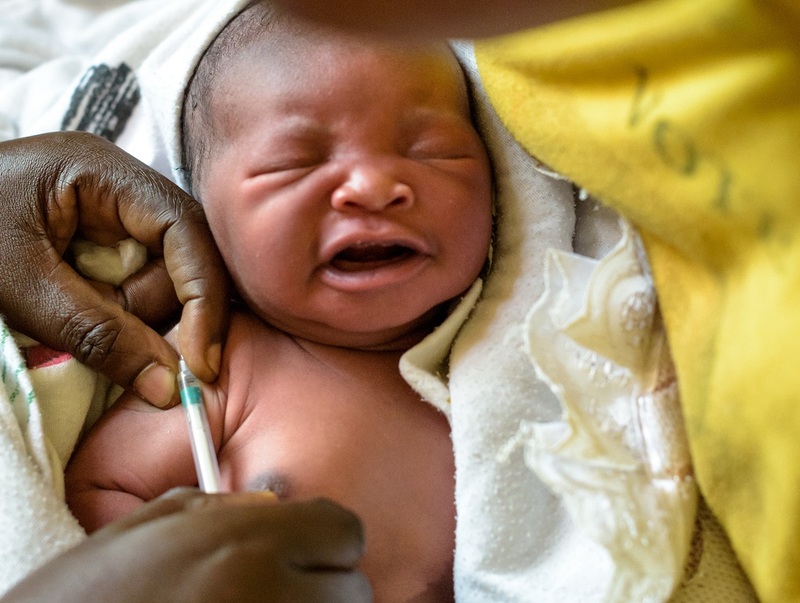 For World Immunization Week, we look at where things were 23 years ago. As 8-year-old Moe Moe Lwin and her mother sit in the doorway of their home in Mandalay, Myanmar, it’s clear that she is a stricken child. Moe Moe contracted polio when she was 10 months old. Unable to fight the disease with available medicines, the virus infected her body and could have killed her. “She developed a high fever and diarrhea,” said her mother. “There was nothing we could do. The doctor gave her some painkillers to ease the pain.” They just had to let the dreaded viral infection run its course. According to the United Nations, approximately 200,000 children suffered permanent paralysis resulting from polio in the year 1990. Polio can be fatal, especially when it infects the respiratory system, as is sometimes the case. Though it spared her life, the disease left Moe Moe’s right leg deformed and crippled. Unable to learn to walk, Moe Moe had to drag her limp leg around with her arms and hands. Because polio attacks the neurons in the leg, Moe Moe’s undeveloped tendons had to be lengthened and her leg needed straightening. World Vision provided the reconstructive surgery she needed to begin her rehabilitation in December 1993. Since then a community volunteer, trained by the project, has visited Moe Moe twice a week for physical therapy lessons. It has taken her almost two years of hard work, but now Moe Moe can walk. Many of the world’s leaders pledged to eradicate polio by the year 2000 at the World Summit for Children in 1992. As the old saying goes, “an ounce of prevention is worth a pound of cure.” Polio and several other common childhood diseases are totally preventable with a vaccine developed in the 1950’s. But eradicating polio is a daunting task. The U.N. booklet The Progress of Nations explains that “polio cannot be eradicated anywhere until it is eradicated everywhere.” Among the world’s least developed countries, Myanmar is one of 15 countries in the world considered by the U.N. to be among the most difficult in which to eradicate polio due to the poor state of its health care system and the presence of armed conflict. Without World Vision’s help, Moe Moe Lwin would still be dragging herself around on her hands. Today, as she walks unaided across the floor of her house, her mother and physical therapist look on with pride. Until polio is eradicated in Myanmar, children like little Moe Moe Lwin will need special care and equipment to lead a normal happy life. World Vision’s Urban Integrated Health project is doing just that for many children like Moe Moe. Myanmar’s last new case of Polio was in 2015, but due to poverty and conflict the country remains at risk for the disease. Pakistan, Afghanistan, and Nigeria are the only three countries remaining where Polo cases are regularly found.